A stroller is the ideal option for carrying babies in long adventures. Understanding the psychology of customers, many manufactures attempt to deliver a great number of umbrella strollers to parents. No one wants to spend a large amount of money in an inefficient stroller for their babies. That’s the reason why one of the best recommendations we would like to introduce you today is Summer Infant 2015 3D Black Lite Convenience Stroller. The model features all you need for travelling thanks to numerous gorgeous benefits. It deserves to rank 4.5 out of 5 stars for its great performance. Keep on reading our article and decide whether this stroller is suitable for you or not. Let’s get started looking at this advanced stroller. It comes with the modern appearance that attracts most of admirable eyes at the first glance. The machine is not only compact, but also durable for years. It weighs just only 12 pounds, surprisingly compact in comparison with other strollers. A question raised in our mind is what makes the stroller become so light-weight? Wow, the answer is pretty simple. This tool is covered by premium and aluminum frame, which helps build up its compact and durable design. Alongside with the small weight, Summer Infant 2015 3D makes impressive by foldable ability for easy carrying and moving, especially on the airport or subway. 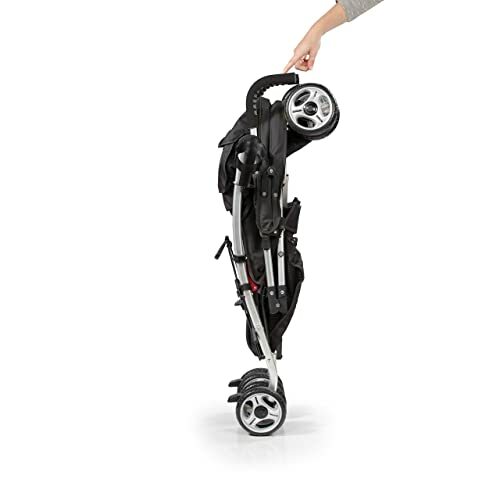 You will find it easy to fold the stroller just only by one hand. Carrying the machine is extremely easier than ever before thanks to the equipment of a helpful shoulder strap. When it comes to purchasing a stroller, quality is the most important factor to concern. With Summer Infant 2015 3D Black Lite Convenience Stroller, you could be rest assured to enjoy all of its gorgeous features below. First of all, parents always look for the largest space inside that the stroller could deliver to their babies. In addition to big space, Summer Infant equips soft materials to enhance its remarkable comfort. Your babies obviously love sitting on the stroller seat area. Another positive feature of using the tool is its high safety. Owning to 4 positions recline with 5 point safety harness, it creates the most comfortable position and safety for small users. Moreover, parents can make use of adjustable canopy to protect babies from sunlight. Take off the canopy if you want it to be lighter for moving. Over time, the stroller is improved to offer the smooth rides for each time of moving. It is effective when running even on hard surfaces or busy streets. This result is due to the combination between anti-shock front wheels and lockable rear wheels. These factors support you well in reducing shocks on uneven streets or parking the stroller. Furthermore, most of parents feel happy to put their belongings into the storage basket. How convenient it is! In order to purchase the best stroller, you should choose well-known brands to invest. A popular way that most of parents make their belief is ordering the product through Amazon.com. It is the largest online website that guarantees to bring the latest product information and promotions to users. 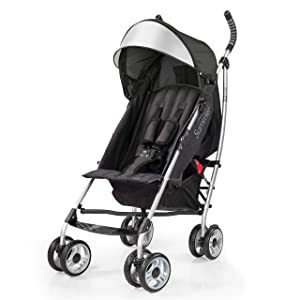 In short, Summer Infant 2015 3D Black Lite Convenience Stroller is an ideal option to match user budgets and requirements. By using this smart stroller, you could easily get benefit from its portability, safety and affordability. If you are on the market and seeking for a perfect stroller for travelling, Summer Infant is a reliable brand to trust. What is up with the blog lag (and it’s not just you, FYI.) I don’t care if you’re packing, but you betetr get some pictures of those babies up here!